Left Balfour in a torrential downpour. Rained on and off all day as we made our way through Kelowna, Vernon, Kamloops and on to 100 Mile House. Stopped for the night in the municipal campground which was adequate and free. Nobody came around to collect the $10 fee. After a short walk in the morning we carried on through Prince George to Fort St James where we camped in Liz and Alex’s driveway. Had a great dinner with them reminiscing about life in DeaseLake and exchanging stories of our children over dinner, wine and a few games of Rummi. Fort St James was the major supply post for the Northwest Company and later the Hudson’s Bay Company after the two companies merged in 1821. Simon Fraser and his partners first established the post in 1808. 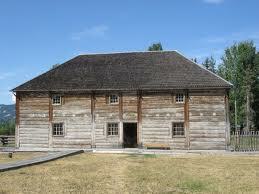 It is now a National Historic Site under the control of Parks Canada. Our friend, Alex, is the full time maintenance person and he offered us a guided tour of the facility. Lots of history and interesting relics of the era. Drove through to near New Hazelton to visit with Dave Hockin on his 70 acre property. Dave is an old friend and fellow musician who I met at Quartz Creek in the ’70s. He recently completed his certification as a music therapist and is now, as a mature student, working on his masters at the University of Northern BC. Since he has reached the ripened age of 65, all his tuition is au gratis. Spent the night there and provided Dave with a (mobile) home-cooked meal. Still raining intermittently. Had a look at K’san Village in Hazelton. 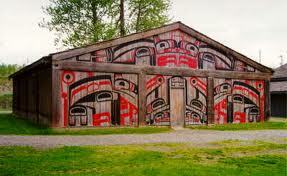 Nice display of aboriginal culture and a good campground on the KispioxRiver. Carried on to DeaseLake. Fuel price was $1.23 in Kitwanga and $1.42 at Bell II. We toured around DeaseLake, visiting with Martha Quigley, Carol and Mike Danielson and Steve and Sylvana Quigley. Many changes in and around the village were evident. Although there is more mining activity, the town of Dease is in decline due to most of the workers staying in the mining camps, then going out to Smithers or south for their time off. The highway is hard surfaced all the way to the Yukon now which makes the trip quite a bit quicker and less stressful than the previous versions of gravel road. Had another great supper with the Quigs and Mariko, Chloe and Justin Waite – Mariko is Steve’s daughter. 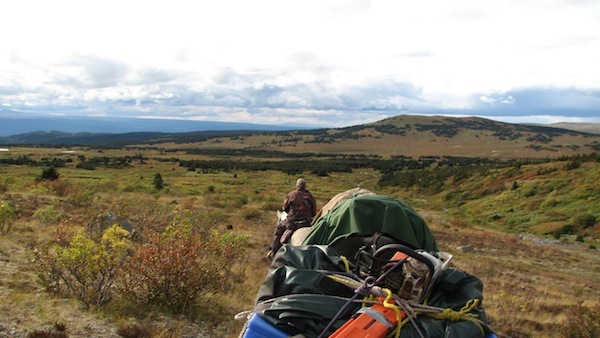 Mike and Carol Danielson operate a guiding and outfitter business in an area east and south of DeaseLake into the Spatzizi Wilderness area in cooperation with the Iskut Indian Band. It’s called Little Dease Ventures. I asked them if they ever entertain non- hunters. Mike offered to let us come with him on a trip into the area some year in late July when he is taking the horses in to the camps. That would be an excellent opportunity to have a trail ride, step back in time and perhaps get some pictures. To get a better glimpse of how these businesses operate, check out their website at http://www.littledeaseventures.com . This entry was posted in To The Yukon With Miss T - 2012. Bookmark the permalink.